WE ARE FULL! Kitty Devore Rescue foster care program is currently full. We are unable to accept new cats or kittens into foster care at present time. Kitty Devore Rescue does not have a facility. We are a foster-based rescue group comprised of like-minded individuals and families all over Southern California with a singular goal: To save the cats of Devore Shelter in San Bernardino, California. We rescue cats from this shelter or cats who are at risk of being surrendered to this shelter, give them a safe place to stay in our homes, rehabilitate them, vet them in accordance with specific vetting standards and then find new adoptive homes for them with wonderful families who will love them for the rest of their lifetime. Hundreds of thousands of animals are abandoned at shelters all around Southern California every year. Devore Shelter alone sees approximately 26,000 animals admitted annually. We are successful at what we do because we keep our focus exclusively on rescuing cats from this one singular shelter. While we wish we had the ability to help all cats in need everywhere, we do not have the manpower, the resources or the funding to be able to do so. Sadly, there are always more animals in need than there are people willing to help them. We do the very best we can with what we have. Depending on the time of year, we receive a minimum of 5 to 10 pleas via email, website, our public Facebook page and by phone every week from people who are seeking alternatives to surrendering their cat or cats to a shelter. We know those who contact us are aware that most governmentally run shelters like Devore are kill shelters where cats only have a limited time to be rescued or adopted before they are euthanized. Logically, a rescue group that doesn’t euthanize would be a better option. Unfortunately, a rescue group like ours doesn’t have the unlimited capacity to house, feed, medicate and vet cats as the shelter does, even for the limited amount of time they do. Even if we do agree to consider your cat for placement, we cannot make any guarantees we can secure them a placement. The best we can do is try – but please know it is never an instantaneous process. It can take up to several weeks and sometimes longer depending on the time of year. Our foster families are often full and their ability to take a new kitty into foster care is contingent on one of their other foster kitties being adopted and whether or not the cat being surrendered is a good match for their foster home situation. You can actually be a cat’s best advocate by utilizing social media to find him or her a great new home rather than surrender him or her to a shelter or request possible placement by a rescue group like ours. A great bio and some nice photos posted to your own Facebook page or flyer can do wonders to secure a home you’ll feel great about – and it will minimize or even eliminate the trauma your cat will experience at being surrendered. Another option is Rehome by Adopt-a-Pet.com and The Petco Foundation. 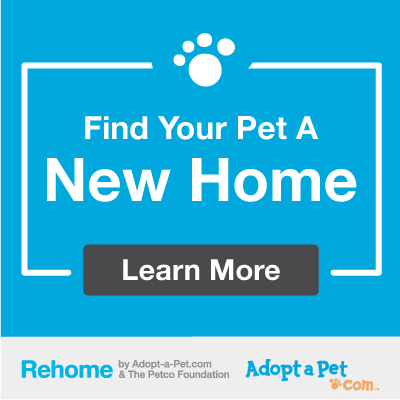 Rehome is designed to help pets go from their current home directly to their new adopter without ever entering a shelter, placing an additional burden on a rescue or ending up in dangerous hands via a classified site like Craigslist. Rehome will enable you to create a pet profile for your kitty so that he can be seen by prospective adopters who visit the Adopt-A-Pet website. It will give you the control of reviewing online applications that come in when someone expresses interest in adopting him. The service also provides guidance on how to review applications, set up and carry out Meet and Greets with prospective adopters and finalize the adoption process. Please be aware, we are not Animal Control. We are unable to come out to properties to trap or round up stray cats. Provided we have an available foster home, we can consider your cat for Kitty Devore Rescue foster care if the cat is healthy and has tested negative for FeLV. Yes, that means if the cat has not been tested yet, you must get him or her tested and be able to provide the results to us for verification. By law, we can only consider cats who are not microchipped or, if microchipped, are being surrendered by the person the microchip is registered to. The only exception to this stipulation would be a family member acting on behalf of a deceased owner. If you do not know if the cat you’re seeking to surrender is microchipped, we urge you to take him or her to your local vet to be scanned for a microchip first before filling out this form. Again, while we wish we had the ability to help all cats in need everywhere, we do not have the manpower, the resources or the funding to be able to do so. Our rescue focus is exclusively on the cats admitted to Devore Shelter or those at risk of being surrendered there because their owners live within or they, themselves, have been found within Devore Shelter’s jurisdiction. We are sorry but we are not able to take your kitty. What standard vetting procedures has this cat undergone? How many cats? List name, age, color, hair length, gender and vetting procedures for each cat. Please upload proof of vetting procedures if you have them. If Kitty Devore Rescue is able to secure a placement for my cat(s), I agree to relinquish all rights of custody and ownership of the cat(s) to Kitty Devore Rescue or one of their members or rescue partner rescue groups at the time of pick-up or delivery of the cat(s) into their care. I agree to do so without expectation of reimbursement of any veterinary expenses I may have invested in the cat(s). I also agree that once I have surrendered my rights of custody and ownership of the cat(s) to Kitty Devore Rescue, I am not entitled to information or updates about his/her/their care while in our foster care program or to have any input into their subsequent care after surrender. I agree that I am also not entitled to any information, updates or input regarding his/her/their new owner when they are adopted into a new home. I also agree that I am not entitled to any portion of the adoption fee. I understand that should I change my mind after I have officially surrendered my cat(s), I will be required to undergo Kitty Devore Rescue’s adoption process or the adoption process of one of our members or rescue partner rescue groups. This will entail completing and submitting an adoption application and, if approved, undergoing a home check. The adoption process will also include the payment of the adoption fee in full. If the cat you are requesting placement for meets our criteria, we will be in contact within 24 hours to discuss your cat’s situation further. However, even if he or she does meet our criteria, we still cannot guarantee we can secure a placement for him or her. We will do our best but, as previously mentioned, placements are seldom instantaneous and are contingent on either one of our foster parents or rescue partners having an opening to take them.